It's Facebook Fridays! for April 17, 2015, and it's time to put an end to people talking trash about you! 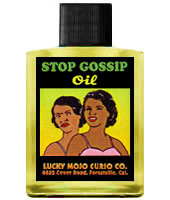 The Lucky Mojo Curio Co. is hosting a random drawing to give away 6 potent Stop Gossip spiritual supply prizes. 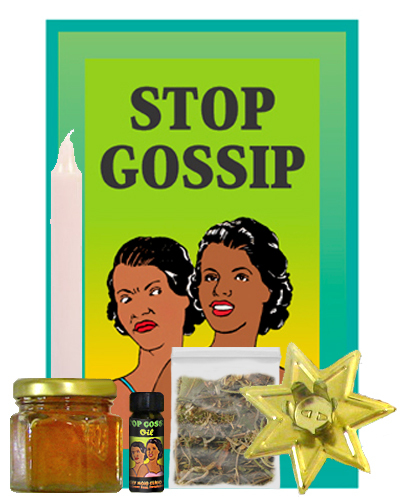 This week we are giving away a Stop Gossip Honey Jar Spell Kit complete with instructions and all ingredients, a Stop Gossip Power pack (including Dressing Oil, Bath Crystals, Incense Powders, and Sachet Powders), a bottle of Stop Gossip Dressing Oil, a packet of Stop Gossip Bath Crystals, a packet of Stop Gossip Incense Powders, and a packet of Stop Gossip Sachet Powders. First thing tomorrow morning, we will select SIX winners at random, announce their names here, and ask them to message this Facebook Page with their mailing addresses, so we can send them their FREE Stop Gossip products. Thanks for posting this, Ernie. All ya all -- get on over there and ENTER THE SWEEPSTAKES! We have a winner! In fact, we have SIX lucky winners! Our Facebook Fridays! winners for April 17, 2015 are: Mallorie Vaudoise, Bianca Andrade, Tonja Marshall, Cynthia Anderson, Vicky Sirgo Gutierrez, and Steven Rowand.